Dark rides are the heart and soul of most theme parks. While a dark ride may take many forms, they all have some common characteristics, namely that they take place indoors, follow a path through the attraction, and tell a story via show scenes containing props, audio, and special effects. Dark rides can range from a slow ride past recreations of iconic scenes to a wild high-speed escape from an adversary, but all maintain one cardinal rule: Story over thrills. For this challenge, you must create a dark ride for your park. You are free to use any ride system you desire and any types of scenery desired. Additionally, there are no scale restrictions…a simple Fantasyland-esque dark ride will be judged equally to a major E-ticket level attraction. The only requirements are that your attraction is primarily indoors and, if you include thrill elements, that you ensure the story remains the focus for the entire experience. What counts as a dark ride? Due to the nature of this attraction type, there are some gray areas. In general, enclosed roller coasters such as Revenge of the Mummy or Verbolten are not acceptable for this challenge. However, a roller coaster with a very limited coaster element, such as Blazing Fury or Wonder Mountain’s Guardian, may be used. Attractions centered around a thrill element, such as Radiator Springs Racers, are also not acceptable for this challenge. For the most part, anything else is acceptable as long as it conforms to the general rules listed above, but please ask the judges if you are unsure. All proposals must be submitted by Saturday, June 11th at midnight. The unexplained phenomenon of the weird and unusual will be on display with attractions that will include "Dr. Jekyll and Mr. Hyde" and "The Phantom of the Opera". I just wanted to clarify if I can use of these two tales of the strange and bizarre? Both Dr. Jekyll and Mr. Hyde and The Phantom of the Opera are both Public Domain works, which means you can use them as you see fit provided that they do not reference derivative works (such as Andrew Lloyd Weber's version of The Phantom of the Opera, so don't use a soundtrack from that musical). The story of Ivan Tsarevich is known to every Russian child. Like many a legend, it is utter simplicity: Ivan, the youngest son of the Tsar, sets out on a daring quest to best his boorish older brothers by retrieving the legendary Firebird. Most versions see Ivan quickly befriend a benevolent Grey Wolf capable of flight. Together, they trek across fantastical landscapes having picaresque adventures. 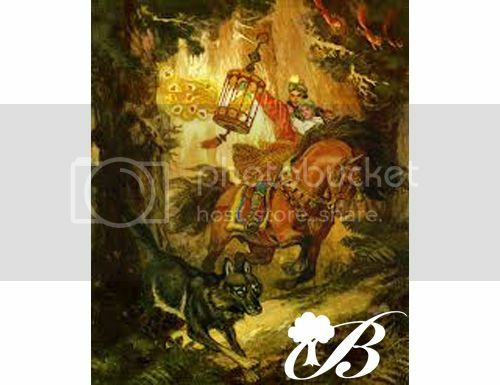 Our version follows this outline, with additional elements from “The Little Humpbacked Horse,” a similar fairy tale inspired by “Ivan Tsarevich.” Such a story is easily told wordlessly in dark ride format to a multilingual audience, and is accessible even to those who have never heard the tale. The ride’s palatial façade, painted like fanciful Russian textiles, is the home of Tsar Dadon. (Ride signage is in both Cyrillic and the Roman alphabet, to aid international guests.) Thatched, curving rooftops arise, one from another, topped by a curlicue steeple. Atop this steeple is an astounding clockwork mechanism which alludes to the story within: A spring-loaded puppet of Ivan Tsarevich sails aboard his beloved Grey Wolf, which orbits the parapet. Here within the greater interiors of Folklore Forest are overflow queues through Tsar Dadon’s immaculate hedge maze. Passage into Dadon’s palace brings guests to the Tsar’s library. A roaring fireplace accompanies cozy furnishings fit for royalty. Even now, the story is set subtly. Three sparkling golden apples rest on a desk. A painting of Tsar Dadon hangs over the mantel. Nearby are three more paintings, which illustrate the personalities of his three sons: haughty Dmitri, boastful Fyodor, and thoughtful Ivan. The queue continues down twisting, vaulted stone passageways, adorned with medieval artwork of the Firebird. This creature, an unattainable bird of radiant plumage, is repeatedly depicted stealing from the Tsar’s apple tree. The passageways at last deposit guests in Dadon’s Great Hall, the loading room. Wall-mounted torches provide a warming glow. Just as many a classic dark ride foreshadows its story via mural, so do we through a series of ornate tapestries on the far wall. Cast members in regal finery gently help guests to their Wolves. “Ivan Tsarevich and the Grey Wolf” is a whimsical suspended dark ride in the tradition of Efteling’s “Droomvlucht.” It utilizes Intamin’s 4-seater model, with two rows of two, as found at Universal Studios Singapore’s “Sesame Street Spaghetti Space Chase.” Ride vehicles are designed to resemble the flying Grey Wolf; guests sit upon a woven canopy on her back. Loading is accomplished continually through a conveyor belt system, which alleviates the sometimes-dreadful hourly capacity of suspended dark rides (520 for “Peter Pan’s Flight”) to a respectable 1,200. Ride duration is 3 minutes. Riders assume the role of Ivan Tsarevich himself. They first exit the Great Hall and arrive at Tsar Dadon’s walled gardens at night. Their Wolf remains earthbound for now, for the palace grounds are enchanting enough on their own. For this is no ordinary garden! 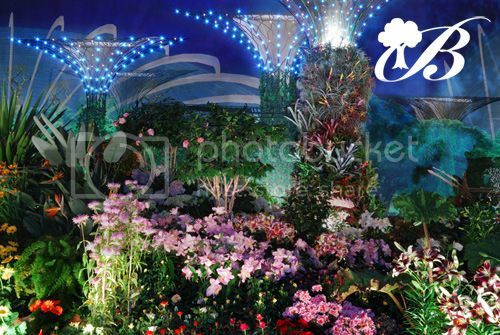 Rather, this is a garden of jewels, with every plant bearing not fruit but a unique precious gem. LED lights twinkle from the diamonds, rubies and sapphires. Black light effects lend to the otherworldly sensation. The Wolf rounds a jade bush to behold Dadon’s proudest treasure: an apple tree bearing shimmering fruits of solid gold! At the base of this tree are the Tsar’s two eldest sons, Dmitri and Fyodor, sound asleep. (Animatronics on “Ivan Tsarevich” use simple, repeatable motions, and are realized inexpensively in an illustrated storybook style.) A magnificent glow draws riders’ focus skyward. Projected against the ride’s star-filled walls, the majestic Firebird flies away, a stolen apple in its mouth. A single feather, glowing red hot, floats down. The Wolf follows, through the palace’s outer walls. Guests are plunged into darkness. Illumination comes from the Firebird’s pulsing feather, now held in the Wolf’s mouth (previously unseen, now present for the ride’s remainder). The fiery feather reveals a claustrophobic forest. Eyes peer from behind dead twigs. Unfriendly wolves snarl. Now, when all seems dire, the riders’ Wolf takes sudden flight! Guests glide upwards through the branches, into the skies! The Wolf descends gently – yet thrillingly – past East Indian palace walls to the sanctuary of Tsar Berendey. The Wolf’s gaze, diverted from the Firebird, focuses towards an astounding vision in the Tsar’s stables: Here is the Horse with the Golden Mane , with glistening LED locks and a bejeweled bridle. As riders reach the horse, bells on strings ring out! The Wolf swerves left and upwards, passing ever-larger bronze bells which sound the alarm. Balcony doors open; animatronic guards emerge. The Wolf flies ever upwards in escape, now navigating a chiming bell tower and past rooftop onion domes. The village below is rendered in increasingly-smaller miniature, to simulate this ascent. Ever higher riders fly, until the entire storybook village shimmers below in the night air. Church bells still ring out. Guests get just a moment to admire this tranquil sight when – a geyser of water shoots upwards before them! The Wolf swerves to dodge, revealing the entire landscape seemingly hundreds of feet below. Berendey’s village rests precariously on island cliffs...and not just any island! All the world sits on the back of a stupendous Monster Whale, swimming calmly through the seas! Suddenly the Firebird comes back into view! The pursuit resumes in earnest, further upwards into the magnificent twinkling star-fields of outer space. With the casual illogic of a fairy tale, colorful tropical birds fly past. More wonders parade past: A magical winged stallion, and also the diminutive, fabled Humpbacked Horse, flapping its mule ears to fly. The distant Firebird alights atop the otherworldly Palace of the Moon. This marble palace occupies a lush, hovering stone parapet, suspended in the ether. Waterfalls plunge from the crag’s edges, only to dissolve into dew. The Wolf swoops daringly into the palace interior. A rippling effect, like water reflected on walls, sets the scene. Riders are welcomed by the lovely tsarina Helen, who has in her possession the Firebird – finally glimpsed up close and at rest – held within a cage of intricately-carved gold. Strobe lights flash from the Firebird, which emits an overwhelmingly heavenly aura. As the ride soundtrack crescendos, the Wolf traverses a spinning vortex tunnel made entirely of glowing Firebird feathers! It emerges on the other side back on Earth, on the ground, passing again through the darkened forest. Only this time, the forest is alive with light and life! A stupendous animatronic marks the finale, inspired by the tale’s most iconographic image: Ivan and Helen, arm-in-arm, upon the Horse with the Golden Mane, shimmering Firebird in Ivan’s arm and the Grey Wolf by his side. The Wolf reenters the palace of Tsar Dadon. The last thing guests see, before returning to the Great Hall, are Dadon and his sons Dmitri and Fyodor, along with their royal consort. All line the palace walls, where they greet the returning riders like heroes, with trumpets and banners and fanfare. Upon exiting their Wolf, guests depart from Tsar Dadon’s palace, overcome with wonder and awe. They find themselves deposited alongside “Yershov’s Stables,” an unobtrusive post-ride shop based on “The Little Humpbacked Horse.” These are the immaculate stables where Ivan’s horses now make their home following the tale. Simplistic limited-motion horse figures imbue this space with character. Guests may purchase, among other treasures, their very own glowing Firebird feathers – light-up LED wands, basically. With these, they might continue their own adventures in the style of Ivan Tsarevich. 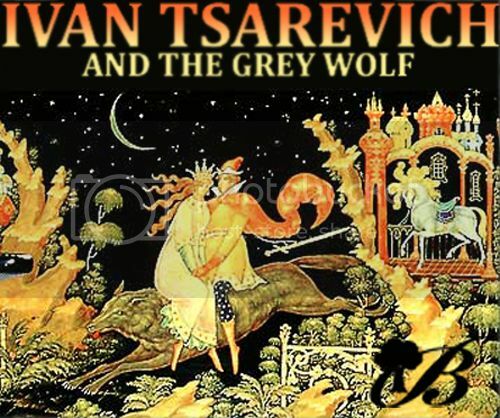 “Ivan Tsarevich and the Grey Wolf” is a whimsical and serene journey which speaks to the very heart of Buyan Park. 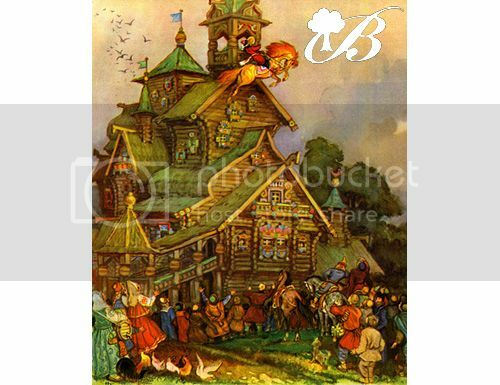 It treats on one of Russia’s most beloved fairy tales with imagination and joy, designed to delight all ages. DISCLAIMER: I am not good at HTML and I could not get the images I wanted uploaded. In order to fully appreciate this post, you would have either seen the movie or try looking up the images on Google if you want a clearer image of what I'm trying to convey. I apologize if anyone has difficulty making sense of my pitch. •“Disneyspeak” Synopsis: Take a wild ride through the depths of Riley’s mind with Joy, Sadness, Fear, Anger and Disgust. •Additional Notes: Offers FASTPASS and has no height requirement. As previously stated, Pixar Studios is the largest of the park’s “production zones” which will have an indoor courtyard area with gateways to experiences based on individual Pixar films. Here, guests will see the attraction’s name in a large marquee with entrances for Standby and FASTPASS. The backstory is that the guests are “figments of Riley’s memories” (which especially comes into play during a particular moment in the ride) who are invited by the five main emotions for a Head Quarters open house to tour the various areas of Riley’s mind. As guests enter the main queue, they begin their experience by entering Head Quarters by passing through long switchback corridors aligned with the various multicolored memory orbs. They are then led into the Hall of Core Memories, a large rotunda area where we see Riley’s Core Memories projected on a large screen. For each core memory, a large memory ball pops up from a column in the center of the room and “projects” an image on the wall (actually a 4K video screen). We see various moments of Riley’s life from the happy (Riley scoring a goal in hockey) to the sorrowful. (Riley’s family comforting her after nearly running away) Before heading to the vehicle load area guests also see a large map of Riley’s mind which features the locales they will be seeing on their journey. Guests will board their Thoughtmobile ride vehicles in the Memory Dispatch area where Riley’s thoughts (e.g. memories, information, sensory stimuli) are processed before being sent to Head Quarters. Along the walls of this area are the shelves of various pieces of knowledge that Riley has learned over her life (e.g. learning the alphabet to higher level mathematics) depicted in unique ways (e.g. over-sized letters, periodic element tables and mathematics formulas). We also see a humorous schedule of the various thoughts that need to be sent up to Riley’s brain (like math formulas for an exam) or sent to the Memory Dump. (everything Riley learned from her piano lessons except for Chopsticks and Heart and Soul) The area is “overseen” by two memory workers (the colored blobs who work within Riley’s brain depicted as AA’s) who view the dispatch from a control panel above the load area. Here guests will board their trackless Thoughtmobiles (dispatched four at a time) before pulling out of the station and filing into the first scene. Here the vehicles arrive into the main Head Quarters area reminiscent of the film and are greeted by AA figures of all five emotions who turn and face the guests. Behind the figures is a large screen behind them which shows their view of the newly expanded Personality Islands and the rest of Riley’s mind. The Head Quarters set is used as a framing device for the opening and closing scenes similar to Mystic Manor. (Two identical versions of the same room, but with different show programming) Joy welcomes everyone to Riley’s mind and introduces us to the five emotions. She assures us that our tour of Riley’s mind will go perfectly as planned unlike that last time when Joy and Sadness were nearly forgotten in the Memory Dump. However, THINGS GO TERRIBLY WRONG ® as Fear begins to panic as he remembers the pain of those events which causes him to accidentally press the button for the Memory Dump. This causes the vehicles to file backwards out of the scene two by two as we hear the voices of the other emotions attempt to follow after us. Here the four Thoughtmobiles travel backwards two abreast down the Memory Dump chute (projection tunnel). As the vehicles “fall” down the chute, projected images of Joy, Sadness, Anger and Disgust float around the vehicles while they offer their usual bicker between each other about this happening all over again or why we should give Fear less control. To make it fell like the guests are being sucked down the chute, guests feel large blasts of wind blow around them while the vehicles start spinning as they “fall” down the chute. •Car 1-“Floor is Made of Lava” Lake: The car passes by a lake of “lava” with cushions and coffee tables surrounding it. We see Anger in the center of the lake making a snarky comment, which causes a geyser of smoke blows up before the guests. •Car 3-Cloud City: Passes by a house of made of clouds which features Joy relaxing on a floating cloud. We then see the door of the house open as the cloud man appears and tells us to stay away from his house. •Car 4-French Fry Forest: Passes through the “French Fry Forest” with Disgust making a snarky comment about the amount of calories. This scene also has smeltzers which release a French fry scent. The vehicles then leave the Imagination Land scene together and roll into the gates of the Dream Productions backlot as we enter a soundstage where one of Riley’s dreams is currently “in production”. Here, we see Rainbow Unicorn starring in one of Riley’s fantasy dreams (see below) as the Thoughtmobiles get caught up in the fun by dancing (spinning and tilting) with the various nonsensical characters. Amidst all the zany fun, the vehicles start to take a wrong turn into a “closed set” despite Sadness’ warnings. All four vehicles enter a soundstage set where a nightmare is currently in production. The vehicles park four abreast as they enter a pitch black room where they hear Joy and Sadness’ voices telling the guests that they should get out of here as fast as they can. However, Sadness accidentally wakes up a traumatic figure from Riley’s past as it’s none other than Jangles the Clown! Here guests come face to face with a larger than life AA of Jangles who taunts guests with his rubber mallet and laughs with his menacing chuckle. Joy and Sadness (voice overs) tell the guests that they should run at the vehicles as they file quickly out of the room to escape him and into the next scene. Behind the Scenes: Jangles will be portrayed as a large AA figure from the torso up. He will be lying with his head on the ground and slowly rises up before he is fully revealed in the show lighting. After exiting the nightmare soundstage, the vehicle enter a projection dome where Jangles bursts out of the studio and wreaks havoc over the Dream Productions backlot. Joy, Sadness, Anger and Disgust call out to us as we “run away” from Jangles before he corners us over the chasm of the Memory Dump. (The chase effects are simulated via the Thoughtmobile’s motion platform) As we see Jangles coming right at us face to face, he slams his rubber mallet on the ground which causes the vehicles to ricochet over the Memory Dump and literally crash right back into Head Quarters. Behind the Scenes: When Jangles hits his mallet on the ground, the vehicles spin and face the opposite side of the screen which has a doorway into the final scene which is Head Quarters again. The projected image of Head Quarters’ window matches up with the doors to the final scene which the vehicles “smash open” amongst a cloud of smoke. We then return to Head Quarters just as we started only to find it a wreck from our escapade as we see the emotions scorched and messed up from the damage, except for Fear. It turns out that he was worried that the other emotions and the guests were going to get lost, so he send his old friend Jangles to come and save us. We then see Jangles on the viewscreen of the Personality Islands as Fear thanks him for saving the group. Jangles then appreciates the favor and bids farewell to the guests. Joy then closes out by stating that our emotions can sometimes surprise us and play an important role in making us who we are. The emotions bid us a final farewell as the vehicles roll back out into the unload area as the guests exit. As guests exit the Thoughtmobiles, they pass through an Inside Out themed gift shop which offers souvenirs based on the film and personalized on-ride pictures of not only the guests in the vehicle, but the “memory” they were featured in during the ride. In conclusion, Inside Out: Emotional Escapade will be a unique addition to DisneyToon Dubai as it will be the first time this modern classic has been depicted in a major theme park attraction and will provide an exciting experience for guests of any age. The Pirates of the Caribbean ride series has historically been well received by the Disney community. The classic Disneyland ride has been improved upon, and various editions of the ride have been created in newer parks. Disney Royal introduces the newest extension of the this adventurous universe: Pirates of the Caribbean: The Fountain of Youth. The ride itself is designed to maximize efficiency. Utilizing the ride system at the Shanghai park, the boats are connected to each other, minimizing boat to boat interference and wait times. As guests venture into the heart of the New World, a spectacular waterfall resembling Niagara Falls is the prominent scenery. A mysterious ship is balanced on the top of a cliff. This is actually Ponce de Leon’s ship, which is referenced in Pirates of the Caribbean: On Stranger Rides and in the ride. To their left is the entrance to Pirates of the Caribbean: The Fountain of Youth. The ride itself is actually located under mountain on which the waterfall flows. Thus, the queue begins in a cave. The cave is well-lit, and contains various thematic elements to provide the guests pretext for the story. Following the Disney Royal theme, the facade reflects the entrance to King George II’s court. An animatronic King George II sits in a lavish throne, asking guests to form a crew to find the legendary Fountain of Youth before the Spanish King Ferdinand finds it. The queue continues as the guests exit the simulated palace grounds and aboard docks. This is where they are to board the boats. The boat subsequently speeds up. 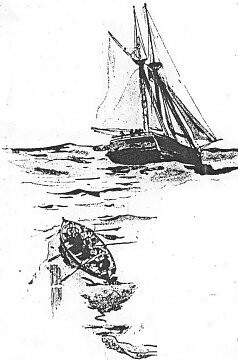 The boat sails into an interior scene of Ponce de Leon’s abandoned ship. Cobwebs and decaying wood are evidence of the ship’s age. The enchanted silver chalices are glowing and prominent in the scene. Riches are strewn throughout the room. Eerie music plays. Suddenly Ponce de Leon’s skeleton, whose face is originally turned away, jerks in the direction of the boat. The boat experiences another small drop. The final scene is the Fountain of Youth. The Fountain glows with power, and animatronics Blackbeard and Barbossa lock swords in their iconic fight. The main theme in the Pirates soundtrack plays. The Spanish, Barbossa’s forces, and Blackbeard’s crew also fight, but they are projected on screens. Drifting past this scene leads guests to the end of the ride. They exit on the departure dock, which is located just prior to the boarding dock. At the end of the ride, guests are invited to buy souvenirs to remind them of their visit, in a small gift shop. Also, an elevator takes interested guests to the top of the mountain, where they can view the scenic park at high elevation. This ride is wheelchair accessible, but guests requiring that service are asked to board the boats using a separate entrance. Pirates of the Caribbean and the Fountain of Youth is a new adaptation of the classic Disney dark ride. With a new storyline and special effects, the ride is an exciting adventure for the entire family. Coming to Toho Studios Park! Chihiro’s Bathhouse is a dark ride based on Miyazaki’s Spirited Away movie. (It is in Ghibli Hills.) Guests approach towards the main show building exterior, a replica of the massive Yubaba’s bathhouse from Spirited Away. This is the bathhouse for the Japanese gods ! Guests approach from through rows of delightful food stands , like the abandoned amusement park. Guests are welcome to stop and eat at these stands, but with caution because in the movie eating at these stands turns you into a pig! A bridge leaks across to the bathhouse. The queue begins before the brige,, in a pig sty. Guests inside admire the squealing animatronic pigs, Now is the PRE-SHOW! Steam rides from a jar, and on it Yubaba the appears, projected. She questions who dares to enter her domain of the gods!? She decides to punish everybody waiting in line, by stealing their names. All gu3sts have RFID chips in their tickets, which know their names in kanji. Yubaba transforms these kanji names in the steam, like when she turned Chihiro into Sen in the movie. Then guests are told that they must work in Yubaba’s bathhouse to get their names back. From here guests enter the bathhouse structure, where there is the LOADING. An AA Yubaba instructs guests into their RIDE VEHICLES – trackless LPS cars that can sit four each, which are dispatched in groups of 4 . These cars resemble giant magical slop buckets, because Yubaba instructs us that we will be working as her scrubbers’, required to clean the bathtubs! Guests happily leap into their magical gliding buckets and magically glide into the spa. First, The buckets line up in a row by the animatronic Frog Demon Foreman, who issues everyone their work cards. Then doors open and the buckets move on into the most wonderful room in the entire ride! The central bathhouse floor! Other parties of rider buckets are already here, for this room they must often pass through to reach other parts of the ride. There is so much activity in here, it is amazing. Animatronic bathhouse guests – giant radishes and ducks and demons and frogs nad potatoes in kimonos – all are all over. Many of these animatronics are trackless, allowing them to “dance’ around the buckets’ and simulating the chaos of the sauna. Thetrackless ride path is determined seemingly randomly, so there is no set order for what happens next. 1.-- Down an industrial hallway. The smell of soaps and bath spices pervades everywhere. The buckets reach Kamagi’s boiler room. Kamagi is a gigantic loveable man-spider AA with stretching arms who must constantly stroke the furnace. A projection mapping depicts his assistants : tiny black sootballs with little eyes roll all over . Vehicles dance amongst the gremlins! 3. -- In the banquet hall, the rampaging No-Face has gorged himself on gigantic heaping piles of – delicious smelling – food. He also has eaten some employees! Buckets near No-Face and the No Face tries to tempt us with gold or with some food it has. The riders instead force No-Face to VOMIT! Torrents of acidic brown water spew from the face of the gigantic AA No Face. Buckets races away backwards to escape its wrath! 5.-- Buckets enter a tiny elevator room. They go ouptairs to the second floor. The Radish God enters, and riders enjoy the radish smell! -- Buckets reach through many gaudy rooms to Yubaba’s office. Golden door knockers – animatronics on every door that opens. The buckets take a side turn. They enter the babie’s chamber. Yubaba’s son, a Baby the size of the King Kong animatronic in Florida, reveals itself and demands that we play with it. As the buckets escape this, the baby cries. The floor shake! Buckets retreat us to Yubaba’s office, where three hopping Bearded Green Heads jump about at us. Yubaba’s harpy, with a Yubaba face, caws! Yubaba’s spirit charges the buckets, casting a spell! The buckets tumble down a fireplace– this is a screen room effect like the trackless Ratatouille ride. The inebriated Haku dragon tumbles down too. Chihiro’s voice beckons to Haku, pleading with him to remember his name. Haku remembers his name! The buckets glide into a gigantic IMAX room, but done secretly so that riders’ don’t notice! The trackless vehicles individually buckle into small motion platforms on the floor, so that the ride’s finale can be like a motion flight simulator. Riders are sailing through the nighttime clouds on the back of Dragon Haku, who transforms into Human Haku. He says that, Yubaba now cannot refuse to give us our names back. Buckets go to the final room. . Yubaba grants us our names back –! Then buckets return to the LOADING ROOM and guests leave. Ride Mechanism - Ghost Train (but note, this is NOT a ghost/spook experience). This uses the ride mechanism of a classic ride, but provides a new experience inspired by both classic ghost trains, and classic fun houses. Elevator Pitch - HocusPocus, the world famous clown from FlashBack’s Circus has gone missing. Big Toppe, the Ringmaster needs your help to track him down… there’s only one place left to check, the old Funhouse he’s been calling home… The funhouse is so big that anyone who enteres immediately becomes lost…. What’s happening in that crazy house? Can HocusPocus be found in time for the show? HocusPocus is one of the stallwart performers in the Flashback Circus. Although he loves to play practical jokes he is extremely absent minded and forgetful, meaning that he often ends up "Pranking himself" as he forgets where he has left his traps. When the Flashback Circus is not playing, HocusPocus remains a stallwart feature of the park, his shows and practical jokes can appear almost anywhere. 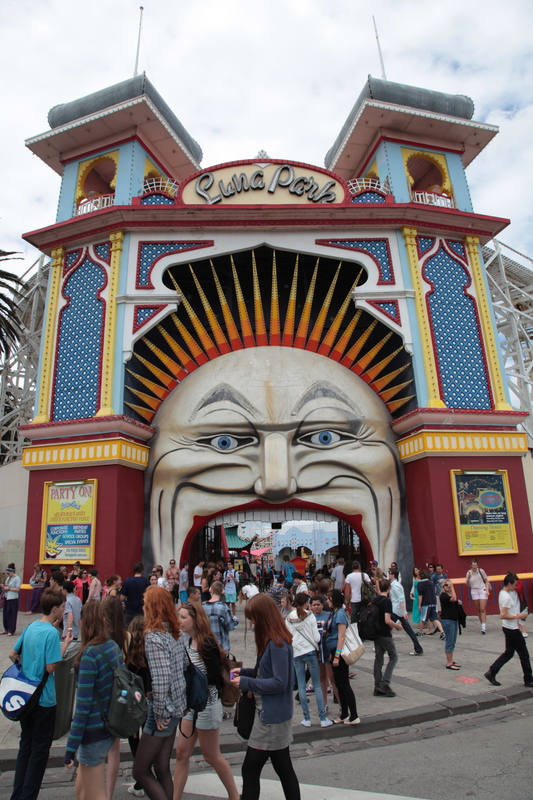 The entrance to the Queue and station area is modeled after the “Luna Park” Gate used in the two operating Luna Parks in Australia. A giant face - this one modelled after HocusPocus rather than Mr Moon of Melbourne (shown). Behind this Facade lies the queuing area leading to the station. Rather than a faux “ghost house” facade, the station area instead resembles a classic travelling funhouse, except on a larger than usual scale. The fun house does look a little run down, but not overly so - it hasn’t welcomed visitors since HocusPocus moved in. Staff manning the station are dressed as classic circus tropes - a Strong Man, Acrobats, Sometimes you might even meet the Lion Tamer or Big Toppe himself. The staff interact with the guests completely in character, thanking the guests for helping them to search through the funhouse. 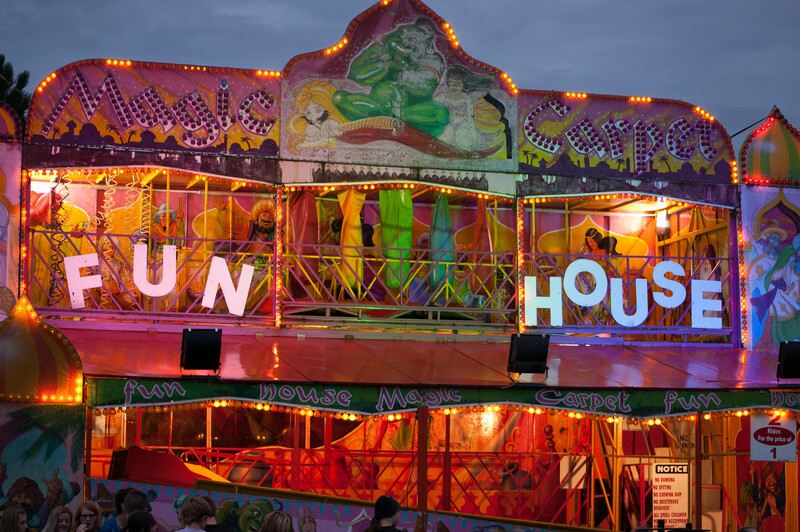 If the staff are asked, they don’t know much about the funhouse - they’ve never been inside. They’ve heard stories but can’t really give any detail, just confusing third hand accounts. When the Circus is not playing, the storyline is adjusted somewhat to just refer to a show that HocusPocus is late for, with the staff appearing in more normal park uniforms. Guests board trains that resemble clown cars. There is only a lap bar as a restraint, as is common in “Ghost train” type experiences. This room is inspired by a common fun-house room where guests enter a room where the floor spins. However, the floor itself spinning wouldn’t be too amusing for a guest in a vehicle. The Train enters a “clownafied” version of a bathroom - Bright Gaudy colours with lots of spots and bright stripes. The room contains a number of rube-goldberg like devices for scrubbing backs, and shaving. There’s also giant “Dr Seuss” like hands attached to the ceiling that appear to be positioned to help someone get cleaned. An overflowing bath can be seen, with bubbles on top of the water, with rubber ducks and other bath toys visible through the bubbles, and the train makes an orbit of this bath. It seems to exit via the same door, but as the room has been Pnumatically lifted (the noise for this covered by the noise in the bathroom) the exit now leads somewhere else entirely…. Scene 3 - The Hall of Mirrors. This comprises of what might just be the “living room” for a clown. Again the room is presented in bright, gaudy circus like colours with dots and stripes. The Furniture in the room appears to be like that which might be found in a comedy cartoon - not quite the right shape. Features of this room include a bookcase filled with Jokebooks, and other books containing very bad puns on popular books (eg - Hairy Potter and the Hair Raising Flytrap) On tables and other flat surfaces can be seen items you might find in a jokeshop - Crazy Glasses, wigs, false noses, etc. There’s also a Coatstand with clown outfits of strange proportions (one sleeve visably longer than the other), as well as some big shoes. A Cuckcoo clock helps the room feel and sound a litlte more “Crazy”, and you can also see many of the practical joke props he uses in his circus show. The kitchen will look like it has been used recently, with a number of strange foodstuffs being on the counter, including “Dodo Eggs” and “Moo Juice” that appear to have being used in some sort of Pancake batter which has been spread all over the walls of the room, giving the impression a clown attempting to cook in a very comical fashion. The room is carefully construcred to make the track appear to be slightly below the ball level, pushing balls out of the way (which are replaced between vehicles). In the pile of balls an animatronic HocusPocus can be seen, dressed in bedclothes and with an alarm clock. As the train enters, the alarm clock rings and HocusPocus wakes up. At first he is grumpy about the noise, but looks at the clock and realises he is late for the circus. He thanks the guests for waking him up, and the train departs for the exit. Accessability - A Wheelchair friendly version of the train can be added on demand. On ride Photo - Photos from the hall of mirrors are available, including both the regular "twisted" mirror, and the live mirror image. Deep in the wilds of the African jungle comes the tale of a man named Tarzan who will eventually become the King of the Apes. Born in the jungle, the young infant boy loses his parents, his mother to illness and his father killed at the hands of an ape attack, and is quickly adopted by another ape, Kala, who had just lost her own baby. 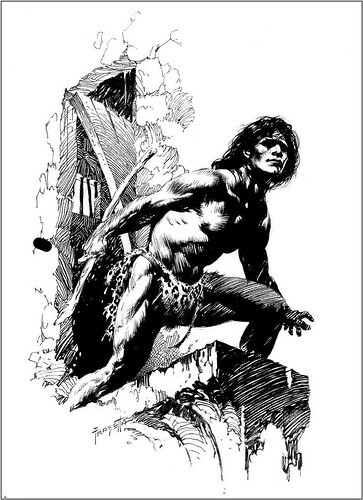 The young Tarzan, whose name means "White Skin", grows up among the apes, learning from them a strong sense of family and a system of hierarchy based on kingship of the strongest. Tarzan grows strong himself and learns the ways of the jungle. He begins to test his skills as a man-ape and challenges the stronger apes and other beasts of the jungle. 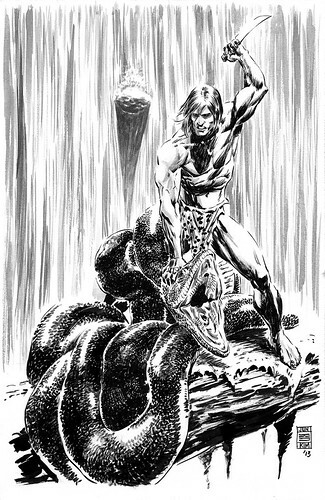 With his various victories of significance, Tarzan soon becomes the King of the Jungle! Guests at Rendezvous Park will come upon an expo hall/show building with a modest facade made to look like an outpost in the jungles of Africa adorned with lush foliage and fire torches marking the entrance. 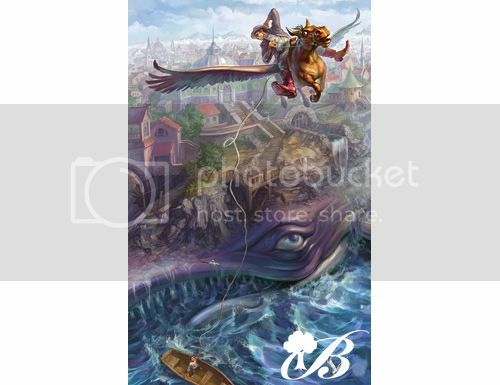 An extravagant mural decorated with the characters of the attraction will introduce guests to the adventures ahead. Within the queue, guests will encounter numerous details of the jungle outpost decorated with tribal artifacts, sketches of animals and maps of the African coast. Just outside the windows of the outpost, various beasts of the jungle will be heard lurking about accompanied by rather menacing, shadowy figures. The load platform of the ride will lie within the final room of the outpost. "Tarzan of the Apes" will be a fully immersive dark ride attraction with faux jungle sets and next-generation animatronics manufactured by Garner Holt Productions. Special lighting will accentuate the uniqueness of individual rays of sunlight peeking through the canopy of the jungle and surround sound audio with a musically imposing orchestration will round out the atmosphere of the attraction. The ride vehicles will have a maximum capacity of six guests with three guests seated in two rows. The ride vehicles will dispatch from the load platform in groups of three. The vehicles will follow a hidden track within the floor and will have the ability to rotate 360-degrees along the track to face the action of each scene. The ride vehicles themselves will be decorated to resemble the two cultural backgrounds of Tarzan, the man-ape of the jungle, with thick, thatched palm leaves authentically hand-woven mixed with a few Victorian flourishes and scrolls. The duration of the ride will be 4 minutes with an hourly capacity of 1440 guests per hour. The attraction is narrated by a young woman with an English accent that describes the scenes and situations of Tarzan's adventures. It is later revealed that the voice is of Jane Porter, Tarzan's love interest. The dark ride begins on the shores of a tropical coast of Africa with a boat coming ashore carrying John Clayton, Lord Greystoke, and his wife Alice. Marooned, John builds a "not uncomfortable or unhappy" cabin in the trees for the couple with the unfortunate threat of the occasional panther and ape attacks. The Claytons have born a son. 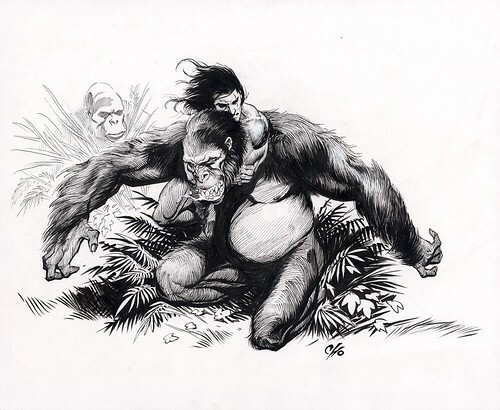 While the infant lies in its cradle, Kerchak the ape enters the Clayton's cabin and charges at John Clayton. During the scuffle, Kala reaches for the infant and escapes from the scene. 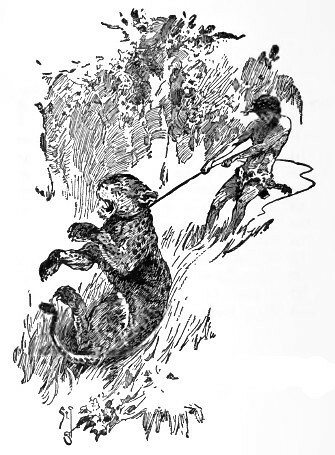 The first action set piece of the attraction, the young Tarzan begins to test his abilities and strength against the beasts of the jungle, using handmade rope from vines to capture jungle cats and boars. The maturity of Tarzan as a man will be highlighted by the first scene of him agilely swinging from the branches and vines of the trees. 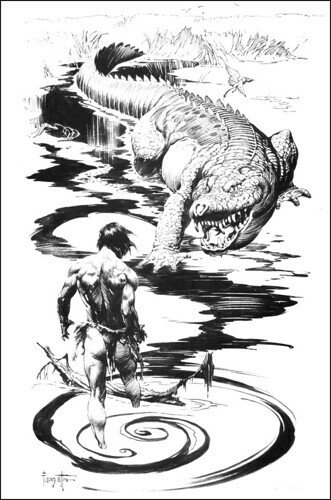 Tarzan, now growing in confidence and ability, battles the larger beasts of the jungle in various other parts of the jungle, including a serpent at the falls and a crocodile at the river. Live running water and larger animatronics will highlight the jungle battle scenes. 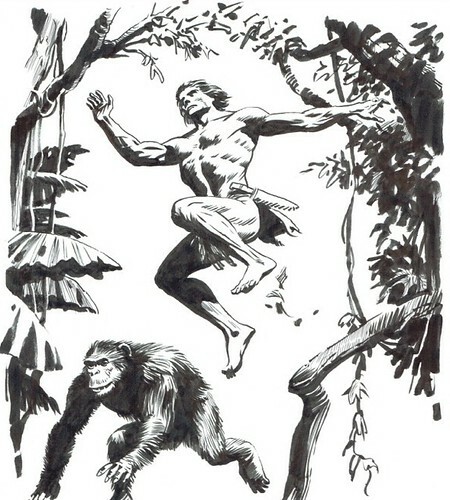 Scene 6: Tarzan of the Apes! 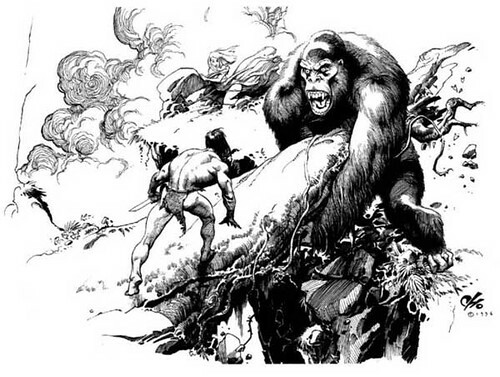 Tarzan faces off against the huge gorilla, Bolgani, the largest animatronic in the attraction. Standing 12 feet tall, the Bolgani animatronic will also be quick and fluid in its movements. 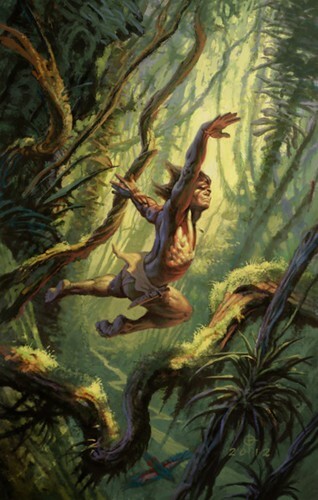 With his victory against Bolgani, Tarzan challenges Kerchak to claim the reign of "King of the Apes". 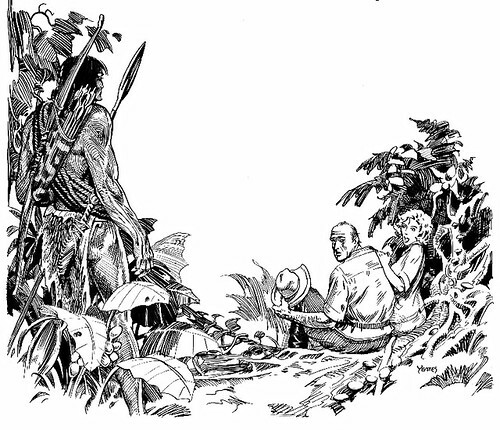 Tarzan meets Jane and Professor Porter, two of his own kind, at the Clayton's cabin. Jane becomes enamored with Tarzan and looks for him in the jungle, but stubbles into a threatening situation with an aggressive tiger. 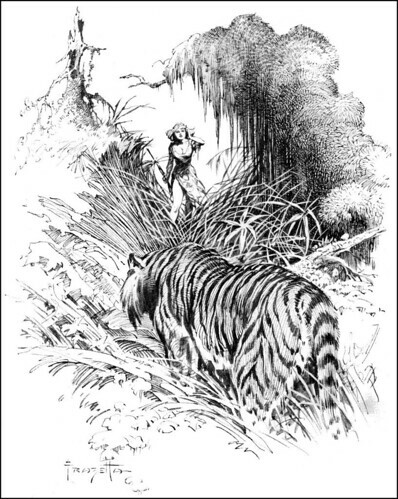 Before the tiger attacks, Jane is captured by natives and taken to their village on the outskirts of the jungle. Under darkness of night, the moonlit shadow of Tarzan darts through the native village and scurries the natives about into a frenzy. From one of the huts in the village, a Tarzan animatronic will swing with Jane in arm into the trees above. Scene 9: Tarzan King of the Jungle! 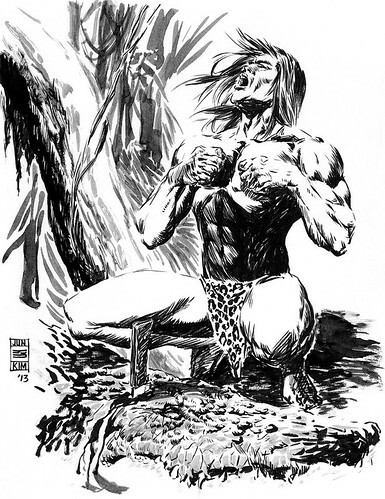 The final scene of the attraction is highlighted by Tarzan in a definitive pose in the jungle accompanied by his signature "call" of dominance echoed throughout the wild. As guests depart from the unload platform, they will be led to a small gift shop set in the jungle outpost where the attraction began, featuring "Tarzan of the Apes" apparel, gifts and souvenirs. "Tarzan of the Apes" is the type of tale Rendezvous Park wants to illustrate in its attractions - popular stories that originated in the early Twentieth Century and are just as significant and well-known today. The universal themes of these stories appeal to multiple generations and the goal of Rendezvous Park & Pier is to do the same. Soar through Arabia on a flying carpet as you experience one of Scheherazade’s many tales. The kingdom was unsettled, bound in a perpetual state of fear. After catching his first wife cheating, Sultan Shahryar vowed to never allow another women the chance to commit such a heinous crime. For each of a thousand nights, Sultan Shahryar took a virgin bride, only to kill her as dawn cracked into the sky. Every morning his men scavenged the village, scouting for the king’s next wife. 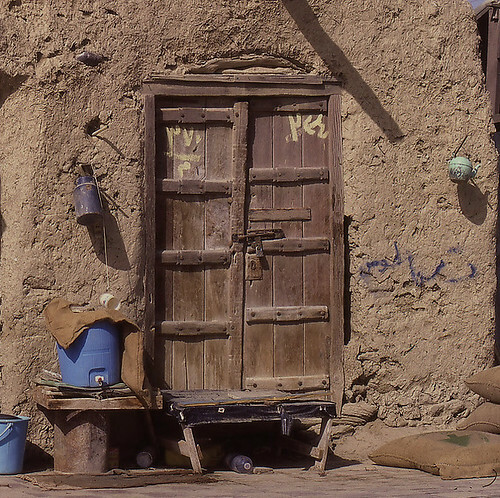 On this particular morning, just as the sun warmed the baked sandstone walls of the village, the soldiers arrived at the house of a young, gentle Dunyazad. No words were needed; their mere presence was enough to strike a fatal fear into her fair heart. As Dunyazad slowly pulled the hijab over her head and stepped through the door, her father grimly swallowing tears by her side, Scheherazade rushed to her arm. “Take me instead.” The soldiers were stunned, but Scheherazade kept her composure, her determined face conveying her unwavering intentions. She quickly pulled Dunyazad aside. “Sister, tell father not to worry. All will be well.” Scheherazade held her chin high as the King’s men escorted her through the village to the palace. Onlookers bowed their heads, bidding their final farewell. Night fell. An eerie peace wafted through the royal bedroom, dancing on the gentle breeze with the faint scent of lilacs. Scheherazade, alluring and composed, looked over the parapet’s balcony at the peaceful city beneath her. Tonight, she thought, will be a story in itself. Suddenly, the doors of the room were thrown open as sultan Shahryar entered the bedroom. With a deep breath, her back to the king, Scheherazade began. Her calm, enchanting voice enraptured the King. He sensed no fear, no trembling. “What are you doing?” he whispered. “Telling a tale, my King,” Scheherazade answered, turning to face him for the first time. “If you so oblige, I beg you to grant me the privilege of telling one last story.” Her mystifying blue eyes captured his soul. Intrigued, he nodded a silent yes. And so it began. Every night, Scheherazade concluded the previous story and began a new one, each more gripping and enthralling than the last. 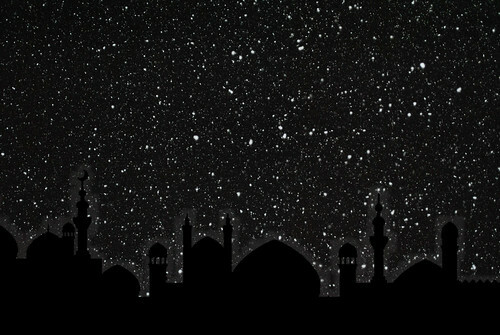 For one thousand and one nights, this continued. Now, Guests at ImagineNations can visit Scheherazade on an Arabian nights and experience one of her fantastic tales. 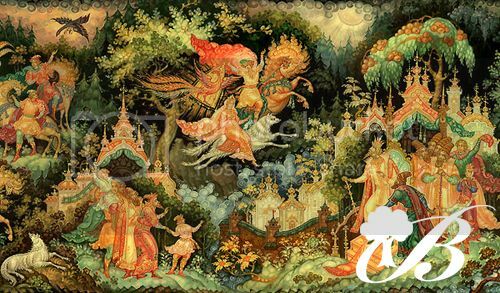 Intellectual Property Many public domain works are entitled 1001 Arabian Nights, each a conglomeration of popular Arabic myths and legends. While their exact content varies, all of them share the framing story of Scheherazade. Tales of the Arabian Night brings to life Scheherazade’s story and some of the wonderful legends she recounts to the king. LocationThis attraction is located inside of the Sultan’s palace at the back of the Arabia section. Technical AspectsTales of the Arabian Night is the first ride in the world to use a modified RoboCoaster G3 ride system. Manufactured by RoboCoaster, this system utilizes a KUKA robotic arm that runs along a three-dimensional roller coaster track. Each ride vehicle is shaped like a carpet and painted in lush patterns adorned with glittering jewels. Two rows of seats can accommodate four adults or six smaller Guests. Riders are restrained with one lap bar for the entire row. The back of each cart is connected to the KUKA arm, allowing for a wide range of motions. In addition, the roller coaster track, while mild, increases the flying sensations felt on the attraction. Three arms travel together, forming a train of flying carpets. There is a theoretical hourly capacity of 2,592 riders. 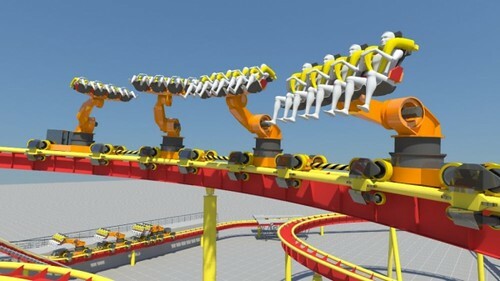 The RoboCoaster G3 ride system. For this attraction, flying carpets take the place of rows, and each train is only three KUKA arms long. The animatronics are highly stylized characters, each about three feet tall. Their arms have smooth, fluid motions. They have blinking eyelids with moving eyebrows, allowing for a wide range of expressions. Mouth movements perfectly synchronize with dialogue, creating realistic characters. The AttractionTales of the Arabian Night, like 1001 Arabian Nights, uses Scheherazade to frame the attraction. However, the body of the dark ride tells one of two different stories: Alibaba and the Forty Thieves or The Adventures of Bulukiya. Each of these classic stories are ones told by Scheherazade in 1001 Arabian Nights and brought to life in this elaborate attraction. Although a dark ride with physical sets, Tales of the Arabian Night takes a new approach to attraction story-telling. Instead of being directly in the scene, Guests watch scenes unfold before gliding to the next one. Comparable to vignettes, each scene doesn’t fill the space of an entire room but is large enough for a train of three carpets to all see. Darkness acts as a veil to the rest of the room, focusing Guests’ attention on one scene at a time. Since only specific sections of the room are lit at once, there can be multiple vignettes in each room, allowing for entirely different stories to occupy the same space and use the same track. Throughout the whole show building, their sets lie on opposite sides of the room. With one train of carpets in a room at a time, Guests experience one story without ever knowing that the set for the other is directly behind them. In this way, the stories of Alibaba and Bulukiya are both told. As the flying carpets soar from one vignette to the next, projection-mapping creates the effect of swirling sand that connect scenes to each other. Each scene is dark and unlit until the carpet glides into position. Then, a few magical swirls of sand drift through the vignette and it illuminates. Because Guests are effectively stopped in front of each vignette, save for a few gentle rocking motions, audio-animatronic characters can seemingly engage in conversations. Since the details of these stories aren’t familiar to everyone who visits, having dialogue allows Guests to more clearly understand the entirety of the story. Instead of passing through a few stitched-together scenes, Guests are witnessing the story take place before their very eyes. The QueueEntering the palace, Guests find themselves in an Arabian desert town, the very home of Scheherazade. The narrow sandstone path winds through the village, past occupied houses and closed shops as the moon rises in the sky. Occasionally, inhabitants will whisper prayers for Scheherazade. Dunyahad can sometimes be heard sniffling to her father, desperately asking, “Why did she have to go?” Posters depict an angry Sultan, with Arabic captions describing his resolution for a new virgin bride every night. The poster images also establish the artistic direction of the ride, introducing the cartoon style of the animatronics and sets. As Guests approach the boarding deck, they wind through the royal gardens. Topiary arches and reflecting pools establish tranquility. Flying carpets glide in, ready to take Guests on an adventure through the Arabian night. For the sake of brevity, this ride-through delineates the story of Alibaba and the Forty Thieves. The Adventures of Bulukiya has the same number of scenes and takes place on the same track. After boarding, the carpets gently rise. Everything is dark, save for a tall parapet that the three carpets surround. Scheherazade waves from her balcony, looking directly at the Guests. “Salaam,” she begins in a smooth voice. “Here for a story? Well, I may have one or two, or a thousand and one.” Scheherazade gently chuckles. “I’ll tell you a tale - a tale of the Arabian night.” One of her arms gracefully extends, throwing magical sand into the air. Through a combination of projection effects and lights suspended by strings, the sand seems to swirl around the carpets, and they tilt forward and begin to accelerate. Stars are above, below, and to the sides of the carpets. In the distance, the black silhouettes of an Arabian village can be seen. The swooping motion of the KUKA arm, coupled with a track with dips and hills, simulates soaring through the stars. After around fifteen seconds of calm flight, the carpets begin to slow. Everything is pitch black as the carpets come to a stop. Scheherazade’s voice can be heard over the onboard audio. The glowing sand effect dances past, lighting up the scene as it leaves. Ali Baba is barefoot in a wooded forest, axe in hand, as he works to chop down a large tree. A distant voice shouts out “Open sesame!”, and a rumbling sound echoes through the forest. Ali Baba’s eyebrows rise in a shocked expression, and he lowers his axe. The platform holding him swivels to put his back against the tree. Cautiously, he peers over his shoulder as a large boulder begins to tremble. Slowly, the massive rock lowers into the ground, revealing a troupe of thieves in the mouth of an extensive cave. The carpets accelerate as the lights drop, magical sand swirling out of the scene. As the carpets decelerate into the next scene, Ali Baba croaks a tentative “Open sesame!” in his unmistakeable voice. 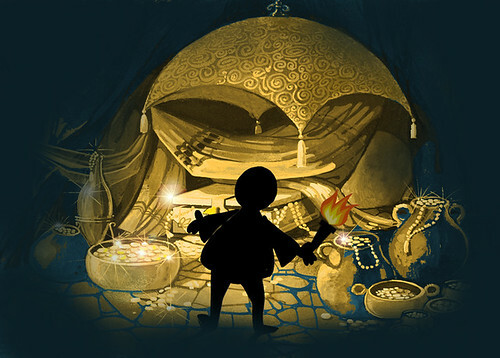 A small vignette lights up, showing Ali Baba waiving around a torch as he explores the treasures of the cave. Golden, glittering artifacts are aplenty. The carpets fly ahead as the vignette darkens. However, just as one darkens another illuminates, revealing Ali Baba on the top of a small hill with a large sack of coins. His eyes are wide, eagerly staring at his newfound possession. The lights drop. Ali Baba explores the treasures of the caves. The carpets float into their next position, and lights reveal a house’s interior. Ali Baba excitedly waives the bag of gold in the air, and Morgiana stands with her arms crossed, clearly displeased. “Where did you find it?” Morgiana curtly asks. “Thieves? Oh Allah, help us!” The lights go down, and the carpets fly to the next vignette. As he finishes his instructions, the front of a house is lit up. A thief, poorly disguised as a tax collector, knocks on the door only to be told, “Go choke on some sand!” That house front is darkened, and lights illuminate the next one. This continues for two more houses, each depicting a comical mini-scene of a thief poorly masking their voice and posing as a beggar, tax collector, or bankers. At every door, they’re humorously turned away. As lights go down on the final front door, a thief calls out “Boss, I found him!” A “Wonderful” turns to an evil chuckle, and the carpets are whisked away. Thieves stand outside of doors like these, hoping to find coins with the crescent moon mark. The carpets slow as the scene illuminates, revealing the front of Ali’s house. The leader of the thieves is disguised and on the doorstep, and Ali stands outside of the doorway. Morgiana suspiciously peers over his shoulder. Behind the troupe leader, there are 39 oil jars. Occasionally, one will rock or the top of a head will peak out of the brim. Clearly, the thieves are hiding in the jars. “Na’am, of course!” Ali Baba beams, never one to turn down someone in need. The lights fall, and the carpets fly to the next scene. A projected moon rises in the sky, indicating nightfall. The carpets come to a stop, but the scene is still dark. A deep snoring can be heard, as well as the cynical creaking of footsteps on wood. The soft, low chuckle of the thief leader can be heard. Suddenly, a creaky jump echoes in the room. The lights turn on, revealing an oil pot on top of the leader’s head with Morgiana firmly holding it down. She’s latched onto his back as he flails his arms in a panic, waiving his scimitar frantically and struggling to remain balanced. Ali Baba is sitting in bed, startled. “You tell your little thief friends to stay away from here!” Morgiana defiantly cries. The thief leader shouts a scared “Yes!” that echoes in the oil pot. Lights drop. As the carpets slowly glide through darkness, Scheherazade’s gentle voice can be heard. 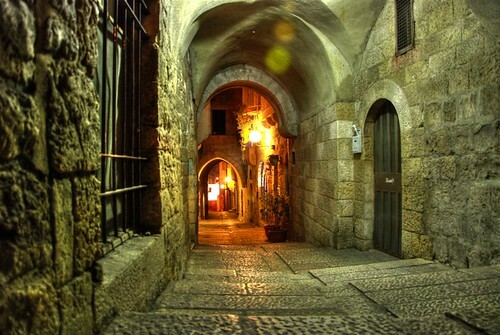 “…and the forty thieves ran far, far away, leaving Ali Baba and Morgiana to live out their years in peace. Whenever Ali Baba needed a few more coins to help the less fortunate, he need only remember the magical words - ‘open sesame’.” As she says the final words, the carpets speed up and fly back through the stars on a mildly thrilling portion of the track. The silhouette of the Arabian village can be seen again, before they pass under a sandstone arch and turn into the unloading station. Starry scenes, similar to the one pictured, enhance the mystic of a flying carpet ride. For Guests who experience the Adventures of Bulukiya story, it follows the same format. Scheherazade’s animatronic begins the ride, and she concludes it with an alternative dialogue. While the track follows the same course, the KUKA arm movements are different, creating almost a brand new attraction. It also faces the carpets on the opposite sides of the rooms, showing different scenes in the same space as Alibaba and the Forty Thieves. 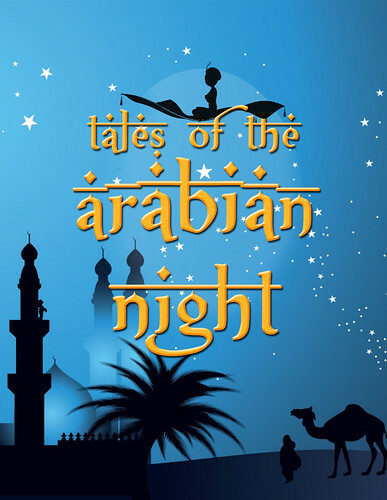 ConclusionTales of the Arabian Night utilizes innovative technology to tell one of the most classic tales of the region. With visually stunning scenes, a breathtaking flying section, and more than one ride experience, this attraction will delight Guests and demand repeat visits. The deadline for Challenge 1 has now passed. Thank you to everyone for your submissions. We will have rankings and critiques for you as soon as possible and will announce the elimination as soon as results are in. Challenge 2 has now been posted, so feel free to start on that as soon as desired. Realdonaldduck, you failed to submit a proposal by the deadline for this challenge. If you wish to remain in the competition, you have twelve hours from the timestamp on this post to either submit your proposal with the bottom three penalty (you will be eliminated for a bottom three finish, not just a last place finish) or declare usage of your Real Life Pass. If you do not respond, you will be officially dropped from the competition. This is a one time offer and is being made due to the limited number of competitors in this season of Theme Park Apprentice. Yellowstone Valley Fire Patrol is new, screen based shooter type ride that takes guests on a rapid firefighting tour of the Yosemite Valley. This ride will be placed in the Yosemite area of the West Coast land. This ride is entered through the door of a fire station. This will be your typical brick two-story garage looking building. The queue begins entering the garage door, in an open room with a line beginning at the other end, near the big sign that says “Yosemite Valley Fire Department. Help Wanted” From this entrance, the queue is themed as hallways moving around, passing doors labeled “Chief’s Office” and “Employee Lounge”. Behind windows near these doors, silhouettes show scenes of things you wouldn’t think of firefighter’s doing. For example, the “Chief” may be frantically pacing, showing that he is stressed about something. The“Employees” may be having some kind of party, etc. Eventually, we are led into the “Yosemite Firefighting Hall Of Fame” where guests can see photos and equipment from real fires in the area. At the end of the hall is a large area, where guests waiting to enter the pre-show may wait. As guests enter the Pre-Show room, they appear to be in some kind of preparation area, based on where firefighters put on equipment. Three large televisions flicker on in the front. On screen is a man in firefighter gear. He explains that he is the chief of fire fighting here in Yosemite Valley. The chief explains that they will be riding in the spare vehicles, as all of the modern ones are already there. He also explains that each vehicle is equipped with six water cannons, and that all you have to do to shoot a burst of water, is pull the trigger. These cannons look like hoses, but the end of the hose is fastened to the car, just in front of the seat. Once the pre-show has ended, guests exit the room and enter the loading area. Guests have now entered into a garage, where cars pull up to a loading dock. The ride vehicles look like old-fashioned fire trucks, seating two riders across, and three rows back. Once guests are loaded, the fire trucks pull out of the garage and into the forest. NOt actually the forest, but a hall with screens showing trees and the forest. Nothing is on fire yet, but faint smells of smoke can be detected. Guests round a corner and are moving through the forest, when riders hear a crackling sound. It is coming from the radio, and turns out to be the Chief. He tells us that the fire is getting bigger. At this point our car changes from moving at a slow pace to reaching about 10-15 miles per hour. Guests round another corner, and seem to be right at the heart of the fire. Their vehicles immediately slow down. Guests must use their water cannons to aim and fire in the direction of the flames. When they do, it appears that water is coming out and the flames begin to go down. Guests move forward slowly here for a minute or so, moving slowly forward, putting the guests focus into putting out the fire. Guests can find iconic landmarks of Yosemite Valley such a El Capitan, and Half Dome, starting here, but can continue to be found throughout the ride. At this time, we receive another transmission, telling us that the fire has reached towns, forcing them to evacuate. He tells us that we’re fighting the largest fire of the century in the valley. Our car jumps forward, slowly gaining speed and zig-zagging around trees and burning barns. Guests are still shooting for another minute or so, when yet another transmission comes through. It’s another firefighter saying that he received word that a family hadn’t been evacuated from a burning town. He says that you need to save them immediately. Guests’ ride vehicles launch forward at 15 miles per hour, now moving over hills and through flames. (These flames will simply be fanned water with red lights on it.) Guests move back and forth through abandoned streets, on fire, before slowing back down and searching the town. Guests move back and forth along burning streets and around houses. Now, guests can put out more fires, before jumping forward into a burning house, where an Audio Animatronic family is crouched in a corner. They stand and ask if you are there to save them. You say you’ll lead them out the the house, and jump forward again into 10-15 miles per hour right through a wall, which crumbles just before impact. (This actually is a garage-type door that opens down, not up.) We race back to the Station, and once there, we are welcomed back by an Audio Animatronic chief. He tells us that we have saved the valley and the lives of the family. Overall, Yosemite Valley Fire Patrol will be a wonderful new attraction coming to America the Beautiful. The attraction is 3-4 minutes long, and has a 36 inch height requirement. This ride truly shows the glory of Yosemite Valley with some great interactive elements. Thank you for this opportunity to turn this in, even though it is late. Is someone playing both sides of the fence here? So, my brother is actually competing and we share a computer. He forgot to sign out and I accidentally posted from his account. I promise I'm not playing both sides. You have a really interesting and unique ride here, it just feels really disjointed. It feels like a collection of unrelated scenes tied together loosely by almost nothing. Now, it’s possible that this is the nature of the original story, or that it’s what you were going for, but to someone who doesn’t know the mythology, there’s nothing holding this together. I think the most effective thing you could do to improve it would be to provide the occasional glimpse of the Firebird. This might make it feel more like a chase than its current form, where the Firebird is largely forgotten through the middle scenes of the ride. So, overall, you have a good ride here, it’s just very disjointed. Inside Out is such a good IP to use, I’m so happy somebody utilized it. Your ride tells a cohesive story that I think will make sense both reading and riding. One thing I worry about though, is whether you’ve adequately explained to guests that they are figments of Riley’s memory before the scene that only makes sense knowing that they are. Another issue is a lack of descriptive writing. While I know what the scenes look like, because I’ve seen the movie, it’s important to always write for someone who hasn’t. If you had written about a movie I hadn’t seen, I would, frankly, have no idea what any of your ride looked like. Just don’t assume that people know. Write to the person who knows the least. The people who know the most won’t mind. But your ride as a whole is quite spectacular, and the story you’ve told is both new and true to the original source material. This is an idea that’s been done before on TPA, but it was only briefly mentioned, not fully written out. Trust me, I used it in the finale last year. But that doesn’t make it less good. I don’t know if you were even aware of mine, but there wasn’t much to my version. You’ve devised a good ride that I think will be a hit. Now, your ride isn’t that long, and that’s okay. One suggestion I have for you is that you maybe add some nods to the original ride. Now, that’s asking you to provide a lot of detail, but details like that can take a good proposal to a great one. Another thing I wish I had in your proposal is more “behind the scenes” stuff. I have no idea how most of your ride works. Are the pirates AA? How about the mermaids? Never leave any detail untold. But, the ride itself is great, and a good fit for your park. Andrew G - Spirited Away: Chihiro’s Bathhouse. You have a fun, entertaining ride here, but I feel that it’s also a bit disjointed. But I think it’s okay for a ride of this nature. It would be impossible to convey a narrative when different people are experiencing different scenes. The scenes themselves are fun, but I worry they could be entirely lost on a guest who is unfamiliar with the movie. There isn’t very much dialogue, which I understand, but if I saw one of these creatures, I’d probably have no idea what they were. Also, it’s important for you to think about how you’re going to convey the “anime” style in three dimensions, and if it’s even really possible to do. All that said, you certainly have a fun and entertaining ride here, but I think my most important piece of advice is to write both to faithful fans and people who are completely unfamiliar with your IP. This is such a fun idea for a ride! I may have worried you couldn’t make a truly original ride, but you’ve proved me wrong for sure. Now, I’m a bit confused by the mechanics of your first room, but It seems clear you understand it. In the future though, be careful of that. But maybe it’s just me and the other judges understand it just fine. Other than that, your ride is really fantastic. I feel like I’m struggling with what to say. You have so much good stuff here. Your scenes are fun. But, I worry that people will come out just feeling sick. I worry that there’s just one too many times when you’re trying to make people feel weird that they’ll come off not feeling well. Just make sure you include a warning! But, for people who like that, as I do, this is a fantastic ride. This is a good ride with a good story, but there’s just a lot happening. I think the ride is too long and too congested. I’d say you need to focus either on the story with Jane or the story with Tarzan becoming King of the Jungle. Or cut down the first half of the ride. Because you have some scenes here that seem long in and of themselves. The way the ride is structured right now, I can’t imagine it being shorter than 6-8 minutes in a way which actually makes narrative sense. I think it’s one of those times when you need to cut things that are unnecessary even if you love them. But besides that, your ride is really good. It just needs to be shorter. This is a really fun and interesting ride! You effectively tell your story through the “vignettes” and it’s an innovative twist. My main issue is with the Kuka arms. They don’t really move on the same plane as a magic carpet would, and I think it could ruin the effect. The other thing is that I think your alternate story isn’t different enough to be marketed as such. It might be more effective to say that there’s different ride programs, but not different stories. But other than that you have a really interesting ride here that I can see working very well in your park. What better way to celebrate the stories of a culture than by telling one in a new way? You’ve got a good ride here, with a solid plot and a solid interactive element. But, you really didn’t tell me very much about it. It’s like you’re trying to write an advertisement for the ride rather than actually telling me about it. I just have SO many questions. Is there a scoring system? Is there a competitive element at all? How long are the two “parts” of the ride? Is it constantly moving like an omnimover, or does it stop in front of screens like Toy Story Mania? How exactly does the “garage type door” work, because frankly it makes no sense to me. You have a vision in your head, and you just don’t manage to get it across in your proposal at all. You also have a lot of typos, so watch out for those in the future. Overall, I can tell you have a good idea, you’re just struggling to put it on “paper” for lack of a better term. Wow! Thank you everybody for your fantastic proposals! It’s going to be really tough to pick someone to eliminate! Wow, we've got some interesting attractions here. Before posting my critiques, I'd just like to say that in my opinion everyone did a good job, so even if a critique seems negative I still enjoyed your work, I just identified more things that you could fix. Also, in case the critique seems a bit weird, note that I do these as follows: I read your proposal, then I read it again and write down thoughts as I go. Afterward, I add a couple sentence summary at the end. Douglas (Ivan Tsarevich and the Grey Wolf): As soon as I read the name of your attraction, I immediately thought "Fantasyland dark ride," and what you've delivered is very close to that idea. Adapting a well known Russian legend is a great option to create a family-friendly dark ride for your park, and you have done it in such a way that no familiarity with the legend is required. The facade of your attraction is great, with my only concern being that it may look out of place to have a large building buried deep in a forest. However, it is a fairy tale, and that type of thing is not uncommon in those. Your queue is very good and sets the story well, and I like the fact that you've made signage in two alphabets. Using 4 seat vehicles and continuous loading is a smart choice as traditional dark rides of this type often have severely restricted capacity. The first scene of your attraction sounds like a visual delight, and you have done a good job of setting the ride in motion without the need for dialogue. The second scene is sure to be a surprise for first time riders, particularly if you kept the ride mechanism hidden prior to this point. The following flight scenes are very reminiscent of Peter Pan's Flight, but your version is more complete and has more action rather than simply gliding above static models. You've also got the correct amount of scenes in your attraction...enough to give it a reasonable length, yet not so many that riders may become bored. The Palace of the Moon scene may be difficult to pull off wordlessly, as Helen was not previously introduced, so riders may be confused as to who she is and why she has the Firebird in a cage. The finale scene following this is excellent and is a great way to close out the ride. Overall, this is an excellent family dark ride that has just enough wow factor to be impressive yet isn't a slave to technology. I've always been a fan of the simpler dark rides because they have become a dying breed, and you've created one of the best in that genre. Well done! Christopher (Inside Out: Emotional Escapade): First off, I'm going to suggest that you attempt to figure out how to incorporate HTML into your proposals. If you need help, we will try to help you. As a last case resort, however, copying and pasting image links is better than recommending searching Google for images. Moving on, Inside Out is the biggest Pixar hit in recent years, and it is absolutely worth an attraction in any general Pixar themed area. The trackless ride system is a great option for this attraction, and I'm glad to see that you've made full use of its capabilities. The facade for your attraction seems a bit bland, but in a studio setting it works. Your queue is great, but I'm having trouble telling if guests are supposed to be in Headquarters during the queue or if they are elsewhere. If the former, it leads to some story discontinuity, as guests would be leaving Headquarters only to return as soon as the ride starts. The opening scene of your ride is great, and I'm glad you went with a new adventure referencing the film at various points rather than simply recreating the movie. Make sure you have some way of separating the riders from the emotions during the second scene as they disappear in following scenes. I love your decision to incorporate riders into Riley's memories, but to get clear scans it may be best to incorporate the scanner into the ride (perhaps during the first scene) rather than placing it into the queue where it may not get a clear picture. Imagination Land is an excellent scene and you definitely take full advantage of the trackless system here. My suggestion is to add a reason the four cars split up (such as a static-filled message from Fear that can be easily misinterpreted) so it doesn't seem completely random. The Dream Productions scenes are both well done, and I'm glad you included a giant animatronic of Jangles rather than simply make him a projection effect. That said, the usage of projections in the Jangles Attacks scene works well there, though an animatronic mallet popping out and striking the floor would complete it. I'm also a little disappointed that this appears to be the only time the vehicles' motion base is used...either use it throughout or leave it out. The finale of your attraction is a nice way to end the ride, and ending in the same place where you began gives a sense of completeness. Overall, this is an excellent E-ticket dark ride and a great way to bring Inside Out to life in your park. There are several small tweaks that could be made, but there are no significant problems with your attraction. Much like Disney's other trackless dark rides, this would be a definite must ride at DisneyToon Studios. Karina (Pirates of the Caribbean: The Fountain of Youth): Many Disney fans still consider Pirates of the Caribbean the greatest dark ride ever built, so creating a new version of it is not a bad option. Using the Shanghai system is smart as it fits better with the ride you described. The facade of your attraction is impressive but confusing, as guests enter a cave yet end up in King George II's court. Why not make the facade the royal palace, which fits much better in the royal theme of your park? While the scenes are good, the beginning of your ride doesn't flow very well. Guests go from a cave, to Blackbeard's quarters, to the deck of Barbossa's ship with limited transitions between them. However, beginning at the mermaid scene your attraction begins to flow nicely. The mermaid scene, Ponce de Leon's ship, and the Fountain of Youth are all well done and are iconic moments from the film. Unfortunately, your ride then abruptly ends. Given what occurs at the Fountain of Youth, a resolution scene would be nice. Overall, you have a decent dark ride, but it is too short and has too many discontinuities to stack up well against the other versions of Pirates of the Caribbean. If several scenes were added, you could have a top tier ride, but as is I would probably consider this a middle tier ride. Andrew (Spirited Away: Chihiro's Bathhouse): As a disclaimer, I am not very familiar with Spirited Away, so I apologize if I miss things completely. The exterior of your attraction sounds impressive, but without a good visual it is difficult to imagine it properly. Your queue and pre-show are okay, and the premise of your attraction sounds ridiculous but intriguing. You have chosen to use a trackless system, and I am glad that you have taken advantage of the unique abilities of this system. Your ride begins as expected, and I like the use of randomized scenes. Unfortunately, this diminishes the story of your ride and makes it a series of disconnected sequences with a thin string of plot tying everything together. Most of your scenes seem completely random, and a couple of them (particularly the banquet hall and stink spirit) would probably be huge turnoffs for those who are not familiar with the attraction. I am also disappointed that you do not seem to include an interactive component, as if guests have become workers to regain their names an interactive element would vastly improve this attraction. Your proposal does not make it clear when the random scenes conclude, so I am assuming that after the elevator everything proceeds in a linear fashion. Unfortunately, this part of the ride makes no sense either and is probably too intense for younger riders (though I can't say for sure how Japan is). Your ride does have a decent resolution, it just isn't entirely clear how we got there. Overall, this does not sound like an appealing ride to me and seems like something that would be a must-do only for its reputation rather than its quality. Perhaps it makes more sense to those familiar with Spirited Away, but it is important that rides appeal to those who are familiar with their source material just as well as those who aren't. I also suggest that you work on your proposal writing, as this proposal was a bit difficult to understand and contained numerous typos. Chad (HocusPocus' House of Fun): An old school ghost train with a modern experience? Very intriguing. I expected your park to have some sort of fun house and some sort of dark ride, but I didn't expect you to do both in one. The facade of your attraction fits perfectly with the theme, and your seeming simplistic queue fits fine. I like the touch of having circus performers running the ride. The first room of your ride sounds super disorienting, but it is a great way to kick off this attraction. The bathroom, however, really establishes how bizarre this attraction actually is. I like the juxtoposition of alternating classic fun house tricks with rooms representing living spaces for a clown, and while strange it fits this attraction well. Your attraction contains a good number of scenes without having too many, and I also feel you chose the correct fun house tricks to show off since some wouldn't adapt well to a dark ride. I'm also glad you do have some sort of resolution in the final scene, even if it turns out the whole ride was just to wake up HocusPocus. Overall, you have a very amusing and very unusual dark ride, but one that I think would become comparable to a cult classic. This is one of those that people will admit isn't particularly great, but they love it anyway due to how unusual it is. Keith (Tarzan of the Apes): After your question, I expected something based on Dr. Jekyll and Mr. Hyde, but you have surprised me. Tarzan is definitely a story that works well as a dark ride, and while many people likely remember alternate versions you've brought the original to life. Your queue is very appropriate for your park, setting the stage for your attraction without going so far as to persuade guests they have actually traveled to Africa. You've picked a good ride system for your attraction and the capacity is definitely sufficient for the size of your park. Having Jane narrate the ride is a good move, and keeping her hidden until later is a nice approach. The opening scenes of your attraction do a good job introducing Tarzan and explaining where he came from. However, in the middle of the ride your scenes begin to get repetitive. 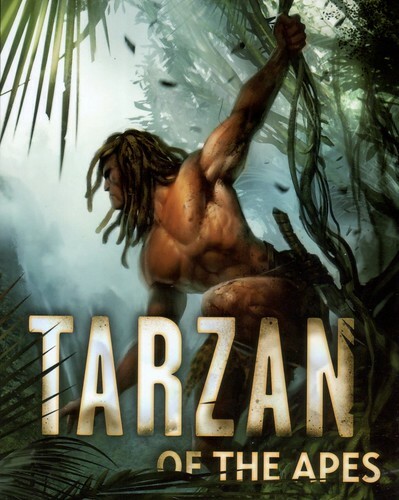 Tarzan fights a snake, Tarzan fights a gorilla, Tarzan fights a lion, etc. It is best to include only the number of scenes required to get the point across, not overwhelm riders by trying to include every single moment in the story. As a result, Jane doesn't show up until near the end of the ride, and her part feels a bit rushed. It would be better to reorganize the ride's scenes to fit the traditional three act structure: exposition, rising action, and resolution, with the first and third act being 1/4 of the story and the second being 1/2. I think you picked the correct way to end your attraction, with Tarzan in the famous pose. Overall, this is a solid attraction, but there is definitely room for improvement. When framing a story for a theme park attraction, always think about what needs to be present and what you can do without, then omit the unnecessary scenes to streamline the attraction. Andy (Tales of the Arabian Night): One Thousand and One Nights is a story made up of many stories, so the idea of offering different versions of your ride is a smart choice. I am not convinced that your attraction benefits from using the G3 RoboCoaster system instead of the G2 (like Harry Potter and the Forbidden Journey), especially since you have created a dark ride and not a high speed thrill ride. I'm also going to say that even with your alternate car, you're going to need a shoulder harness to benefit from the motion of a KUKA arm enough to use that system over a standard motion base ride. Final engineering-ish complaint: You'll never get that kind of capacity on your attraction...assuming 45 seconds between sets of vehicles (to allow for scene reset time), you'll get 1,440 riders per hour. Your queue is excellent with a high level of detail. As you did not mention a choice at any point, I must assume that guests randomly see one story or the other, which is a better option to both keep the line moving and fit with the theme. Since your attraction has multiple stories and only one is fully described, I won't go into the details of any specific scene. However, in general the scenes are all very well done and tell the complete story without any noticeable gaps. I am not a huge fan, however, of the way your ride stops at each scene and the entire thing plays out, then guests simply move to the next scene and the process repeats. This feels a lot like many of Universal's screen-based attractions, just with animatronics and sets in place of 3D screens. Ultimately, this attraction feels a bit more like a show than a ride, with just enough ride elements to legitimately call it a dark ride. Overall, this is an outstanding attraction, and were this a general attraction challenge I would probably rate yours on top. However, as a dark ride I feel it loses a bit due to less of a ride component, and this is what I feel drops it from outstanding to very good. Realdonaldduck (Yosemite Valley Fire Patrol): First, you give the title as Yosemite Valley Fire Patrol, then immediately afterward name it YELLOWSTONE Valley Fire Patrol. Make absolutely certain to proofread your proposal, as simple mistakes like this can be costly. The queue of your attraction is good, but I would prefer a more unique facade that feels like it fits in a national park. The pre-show is decent, and on an interactive dark ride this can be helpful. I like the old-fashioned fire truck vehicles, but given the design of your ride it would probably be better to seat riders in two outward facing rows of three. The ride itself is simple but fun, with the focus being more on the game and less on any type of story. I wish you had gone into more detail as to how scoring works...do guests get points based on how many flames they extinguish, or how long they accurately spray water on the fire? The speed sections seem unnecessary, and given your audience it may be better to just simulate speed via screen projections (accompanied by an onboard siren). I do like that you've switched to practical sets in the second half of the attraction, but for an interactive attraction it is usually better to go mostly screens or mostly sets instead of half and half. Overall, this is a fun attraction that is good but not great. The concept for this attraction has a ton of potential, I just think you haven't achieved it. Also, remember for the future that deadlines count in this competition and you will not be given another chance to submit a proposal late. Once again, thanks to everyone for your submissions. Rankings will be available shortly. Blake has informed me that he will not have his critiques ready until tomorrow, but he has submitted his rankings. Therefore, here is the official scorecard for challenge 1. Congratulations to Andy Teoh and his winning submission for this challenge, Tales of the Arabian Night! It appears that we have a tie for last place between Andrew_G and realdonaldduck. Ordinarily, both of you would participate in a tiebreaker challenge to determine who is eliminated. However, as realdonaldduck submitted his proposal late, he is under the bottom three penalty. Therefore, realdonaldduck, you are hereby eliminated from Theme Park Apprentice 8. However, if you feel that you can do better I invite you to continue following the competition and attempt to earn redemption in a special challenge at a later date. You are welcome to continue submitting proposals unofficially if desired in order to receive critiques and improve your abilities. For everyone else, Challenge 2 has begun. Take a look if you haven't done so already and get started on your proposal, as only 6 days remain. 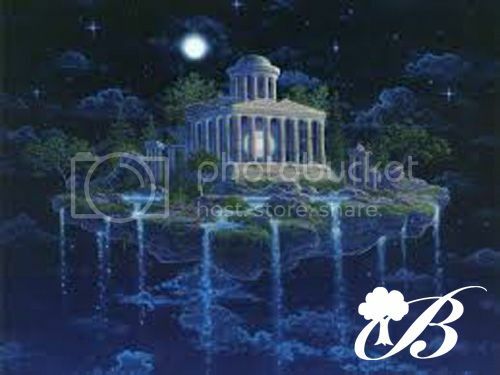 -The source material is fantastic and fits the theme of your park perfectly. -The ride system also fits the storyline and ride perfectly, allowing for a feeling of flying and soaring which is difficult to achieve with other ride systems. -Your queue is lavishly and perfectly themed and gives guests a perfect idea of what’s to come. Great job. -Your choice of soundtrack also fits perfectly and is a lovely piece which gives the ride proper pacing and tone. -Your sets would probably rank as some of the most lavishly detailed and beautiful sets ever seen in a dark ride, easily rivalling classics such as Pirates and The Haunted Mansion. -I feel like 3 minutes is not a sufficient amount of time to experience nine whole scenes of the scope you’re describing. While I understand that the ride is meant to sync with the soundtrack, I can’t help but believe that this is a ride that is sitting at a more extended timeframe of 5-8 minutes. -Speaking of time, if three minutes is the length of the ride, I feel you’re doing a disservice to yourself and your guests. A ride of this nature deserves to be savored, like a glass of fine wine. The pacing would be too quick to really take in what you’ve got going on here. -I really enjoy Inside Out and I think it offers plenty of great “theme park” moments and scenes, most of which you have channeled here. Everything from the queue to the post-ride highlights the fanciful and fantastic world of Inside Out. -The idea of breaking out Scene 4 into four distinct scenes is clever and well done. It would certainly give the ride that re-ridability factor so many other rides attempt to achieve. -I like how you showed that fear is a necessary emotion and guards us from threats when needed. It fits perfectly into the themes of the film and, rather than go the route of returning to Joy or Sadness, allows Fear to be an important factor in the world of the film. Good job. -The trackless system is something that is gaining momentum around the world and I’m glad to see it utilized here. You’ve done a fantastic job of highlighting its strengths and have accounted for its wide range of capabilities. -While the ride is great, it may be a bit too scary for a majority of your target audience (young children). While this isn’t necessarily a bad thing, families going on the ride expecting a fun and scare free ride may find their little ones being terrified. This is the reason why Disney changed the name of “Snow White’s Adventures” to “Snow White’s scary Adventures”. Too many children went into that ride thinking they were getting an innocent Snow White ride and came away being terrified as they were hunted down by a homicidal witch. While the ride itself isn’t as scary as Snow White’s Scary Adventures, I could see how it could scare small children and you may end up with many upset parents. -It would have been good to see a little more incorporation of some of the other emotions in the ride. While I understand that the focus was on Fear, its Joy and Sadness which steal the show in the film. This isn’t such a major problem, but as with the point above, many guests will be expecting a heavy dose of Joy and Sadness. -Pirates is a smart choice for any Disney Park, and with the advent of the new Shanghai Pirates, I think this may be the new mold for all future Pirates. So you’ve made a smart decision to not reproduce the classic Pirates. -You use the IP characters well and they all fit within the theme of the ride itself. Fan service will be served here. -The mermaid attack scene seems both exciting and slightly frightening. You’ve done a good job of envisioning a truly unique version of Pirates with scenes like this. -I’m glad to see you’ve stuck to history with the inclusion of Ponce De Leon and King George II. Great touch. -Apart from being commissioned by King George to find the fountain, I fail to see how this ride really fits into your royal theme that well. -I’m a little confused about why you have Niagara Falls as your façade entrance. Traditionally, the Fountain of Youth is located in South America, not North America. -The pacing of the ride seems rushed and disjointed. The quest for the fountain seems like an afterthought, and your intermediary scenes seem more like random encounters rather than working toward an over-arching story. -The ending of the ride seems to lack the emotional and theatrical punch so many of the other Pirates seem to maintain. Discovering the Fountain should be an awe-inspiring moment, and it seems more like another scene that acts as a backdrop for the feuding characters. -Great choice on IP! Spirited Away still holds the all-time Japanese Box Office record for an animated film so you couldn’t have chosen a better film to base a dark ride on. -You’ve incorporated the zany characters and sets from the film perfectly. For many who haven’t seen the film, this may seem crazy and confusing, but as someone who has seen the film, I’m glad to see you’ve got almost all the major and crazy Miyazaki creations here. -The ride seems fun and exciting. It will surely be a delight to children and families. -I notice you used a lot of “Smell” effects. While this is great for pleasant scents, the inclusion of bad scents in attractions is a terrible idea. People come to theme parks to enjoy themselves and the last thing they want to do while trying to have a fun day at a park is to have their olfactory glands assaulted with the smell of a rotting swamp! -The ride seems to move very swiftly and doesn’t allow for guests a lot of time to truly digest the amount of action and detail you have put into the ride. -While I like the idea of having a common room where all vehicles cross from, I fear it may become slightly redundant after sometime. Especially if you have as many scenes as you do. -I wish you would have incorporated Haku more into the ride. He is easily the most impressive character in the film and functions as the center of the story and theme of Spirited Away. -You have perfect themeing going on here. It fits precisely with your park and the atmosphere you have created. -As an homage to classic ‘ghost trains’ or ‘Laff in the dark’s’ is necessary in a park with your theme and I’m glad to see it included here. -You’ve done a great job at creating a fun and wacky atmosphere throughout the ride. You’ve effectively recreated the ‘world’ of clowining. -Hocus Pocus seems like a great mascot and fun character to base a ride on, especially if he is going to be a major fixture of your park. -Most of your scenes are fun and lighthearted and do a great job of re-creating that ‘fun house’ feel. It’s fast, crazy, and fun. -Your queue also fits perfectly and would be gorgeous to see in real life. -Some of the scenes seem a little disjointed. The spinning room in particular is a great gag, but it may also produce a fair amount of vomit from many guests. -I think your ending is a little abrupt and emotionally unsatisfying. The whole premise of the ride is set up to be a mystery, and while it may be part of the joke that Hocus Pocus simply slept in too late, it still feels rather rushed and tacked on. -Tarzan is instantly recognizable by everyone from age 10-80. It’s got a large demographic and, as far as public domain works go, it’s one of the most well-known. Good choice on utilizing it in a dark ride format. -You’ve clearly done your homework on Tarzan and his lore. The ride follows the tale of Tarzan closely and does a great job recreate the tale in ride format. -The animatronics on this ride would be amazing. All of those large animals would be impressive to see in one ride and the sense of action you’ve put into each scene would surely make for a thrilling and action packed experience. -I would have liked to have seen a little more description of each scene. While the way they are presented isn’t terrible, I’m left wanting more. The ride essentially shifts from one scene to the next with Tarzan battling ever increasing and threatening beasts until he meets Jane. -I don’t think your façade would fit in with the ascetic and theme you’re attempting to recreate with the theme of your park. While it’s very well designed, it eschews the classic Atlantic City Boardwalk feel you laid out in the Entry Challenge. -I don’t know if I can really call this a con, but I’m having trouble envisioning the narration portion of your ride. While it seems harmless enough, I think it may pull people out of the immersive environment you’re creating and instead makes them feel as if they are watching a movie rather than in an immersive and three-dimensional ride setting. As a frame of reference, I am reminded of Spaceship: Earth’s narration, which works for the ride and its goals but does diminish that immersive effect. It forces riders to feel like passive observers rather than active participants in the action. -Firstly, your source material is solid and you know it very well. While the 1001 Nights isn’t as widely read in the states, it’s the equivalent of Aesop’s Fables or the Greek Epics to many other people in the world. -The idea of having two separate rides in one ride is VERY interesting. You’re essentially creating two entirely separate attractions which share a ride system and show buildings. Both effective and efficient. Nicely done. -The ride does a fantastic job of transporting guests to another world and puts them right into the stories being told. -Your queue is also fittingly themed to the land and overall theme of your park. Great job. -While I admire and encourage the use of emerging technology, I’m not sure it’s necessary to utilize a robocoaster system for a ride of this nature. You could achieve the same ends with a dual KUKA/SCOOP system or even a new version of the Omnimover. -I’m slightly concerned with sound and light bleeding into each other, especially if the scenes take place in the same show building. -As far as shooter rides go, this one is pretty unique, and will give guests a good idea of what it’s actually like to fight fires. It’s rare to see a shooter which attempts to recreate real world events, and fire fighting is arguably the best and appropriate way to utilize the technology to mimic ‘real world’ scenarios. -Yosemite is iconic as one of the most beautiful and breathtaking American Treasures. Good choice on location. It fits with your parks overall theme as well as your lands theme. -I think most riders would get a good feel for the danger and risks firefighters put themselves in every day. This could be a very educational ride if done right. -I would have liked to see some variations on scenery and sets. While Yosemite is indeed beautiful, seeing it on fire repeatedly would be akin to seeing one giant forest on fire. -I’m left wanting more. Apart from the rescue of the family, the ride seems to have very little scenes and seems like a standard stock shooter with nothing to set it apart from the competition.